It’s February 28th, 2016. Eric Staal is traded from the Carolina Hurricanes to the New York Rangers after spending the first 12 years of his career in Raleigh. At the time, it appeared Staal’s career was on the down turn. After a 54-point campaign in 2014-15, Staal had just 10 goals through 63 games the next season, and was subsequently dealt to The Big Apple for a playoff push. In the final year of his contract, Staal scored just 3 goals in the last 20 games of the season, and the Rangers were booted in the first round of the playoffs by the eventual champion Pittsburgh Penguins. It was obvious the Rangers wouldn’t re-sign Staal, definitely not close to his previous cap hit of $8.2 million. Staal tested free agency, and signed a two-year deal with the Minnesota Wild with a cap hit of $3.5 million per season. It raised some eyebrows at the time, but now the Wild seem like geniuses. In his first season with the Wild, Staal racked up 28 goals and 65 points in what was a rejuvenating year for the Thunder Bay product. The weird thing is that nobody outside of Minnesota really took notice. Jump to this season, and Staal continues to produce, as he has notched 33 goals and 64 points in 64 games this season, already matching his highest goal total since 2008-2009, nearly a decade ago. Once again, the hockey world has slept on the former Olympic gold medalist and Stanley Cup champion. Other than playing the bulk of his career in a small market, there’s not much reason for the hockey world to sleep on Staal. He’s the 2nd overall pick of the most stacked NHL draft in league history back in 2003, he scored 28 points in the 2006 playoffs, leading the Hurricanes to their only Stanley Cup, he was a part of the 2010 Canadian Olympic Team that won gold in Vancouer, and was a star in the league from the mid 2000’s all the way up to his final years in Carolina. Part of one of the most successful bloodlines in hockey, Staal has won pretty much everything there is to win in hockey, so maybe we shouldn’t have been so surprised when the Wild took a fairly expensive flyer on Staal back in the Summer of 2016. The one thing Staal hasn’t done since coming to the Wild, is make noise in the post-season. He was held pointless in the first round series against the Penguins back in 2016, and recorded just one assist for the Wild in their first round playoff series against the St. Louis Blues, which they lost in five games. After the miraculous 2006 run with the Hurricanes, Staal has only seen playoff action three times, the last two being short appearances, with his only decent run besides the 2006 championship coming in 2009, when the Hurricanes lost in the conference finals to the Penguins. With the Wild currently hanging onto the final playoff spot in the Central Division, Minnesota is looking to rely on Staal’s veteran experience to get them into the playoffs, and help them take down the daunting Western Conference. At 33 years old heading into free agency once again, it would be crazy for the Wild not to re-sign Staal for at least the next couple years, just to see if this crazy resurgence continues. Alright folks I called it, with a solid 40$ profit last week I’m back up to even for the year, now let’s see if I can lose it all this week, this is parlay week, after zero I repeat zero underdogs covered last week Vegas overreacted with lines that are way too big, to compensate I’m doing more teases than ever before! It’s been a week since the eighth installment of everyone’s favourite space opera hit the theatres, and while critics have generally concluded it’s one of the best Star Wars films ever, Star Wars: The Last Jedi has fans divided. Many point to Rian Johnson’s writing and vision for the film, which took on a new approach than we’ve previously seen. While a large majority of fans expected to see an Empire Strikes Back rehash much like the New Hope revamp we saw in The Force Awakens, Johnson went a completely different route, creating what almost felt like the conclusion of a trilogy rather than a bridge-gap film for the next installment. WARNING: There will be spoilers mentioned in this article, I’ll begin with my spoiler-free review first. First off, this is the best shot Star Wars film ever. It’s not even close. From the mirrors scene with Rey on Ahch-To, to the stunning red salt on the crystal planet of Crait, there are many scenes that are visually stunning. There’s also a scene where there’s about twenty seconds of dead silence, leaving the audience to gaze at the spectacular scene unfolding in front of them. Even the settings where stunning in their own way. Snoke’s lair was intimidating, while many fans are divided about the gambling planet of Canto Bight, there are also some pretty fascinating interior shots of the casino, definitely unexpected from a Star Wars film. What also makes this film standout, is the incredible acting from Adam Driver as Kylo Ren. 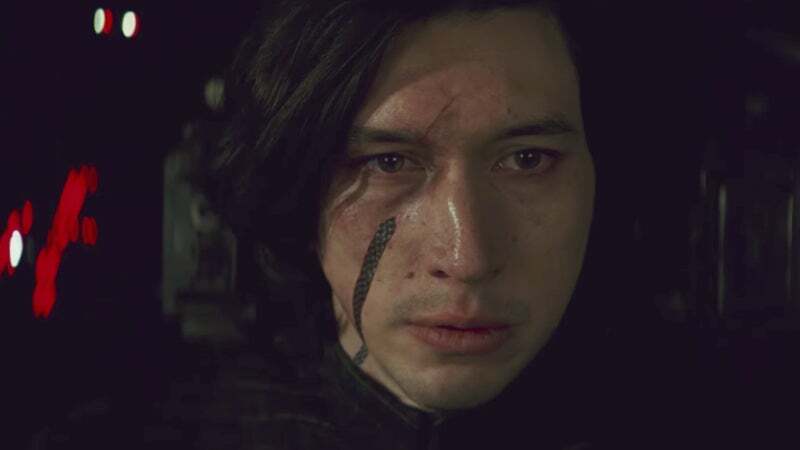 While he wore his mask for a large chunk of The Force Awakens, Rian Johnson decided to let Ren ditch the helmet in The Last Jedi, which was a brilliant move, as we once again saw the inner conflict within Kylo Ren tear him apart. Also, me and fellow contributor Nathan Hutton agreed that Kylo Ren is the best written Star Wars character, ever. While we’ve still got one film left to ultimately figure out the conclusion of Ren’s story arc, to this point, it’s been nothing short of fantastic. Once I get to my spoiler part I’ll be able to elaborate on this more, but at this point this entire trilogy feels centered around Kylo Ren, not Rey, which is where some people might be falsely accusing the film. I went back and watched The Force Awakens last night, and I’m torn whether I prefer J.J. Abrams film or Rian Johnson’s newest take. What I believe it really comes down to is; Abrams’ whole vision was for The Force Awakens to be a crowd pleaser, and drew back from the well of A New Hope in order to satisfy both old fans, and the younger fans as well, intertwining call backs like Han Solo and the millennium falcon while introducing our new heroes like Rey, Finn, Poe Dameron and BB-8. As mentioned before, Johnson didn’t follow suit and went his own path, which will forever be a controversial decision. I still think The Force Awakens is more fun to just sit down and watch whenever, but The Last Jedi makes you focus much more on the story and dialogue compared to the previous film. 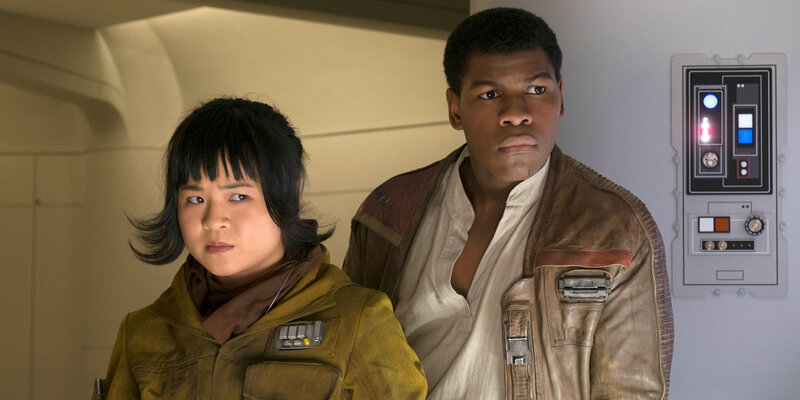 I went back and forth about how I felt about Finn and Rose’s adventures in the movie, it often felt a lot like filler while Rey and Luke’s story line carried a lot more weight and had a better chemistry as well. There was certain points in the movie where I was done with Finn and Rose’s part in the movie, and simply wanted to go back to Luke and Rey or Kylo instead. I also had a couple “why” moments with the pacing of this film as well. It feels like the First Order is just letting the Resistance get away from them for a large chunk of this film, why wouldn’t they just send another fleet in the opposite direction to catch the last of the Resistance? Why doesn’t the Resistance come up with a plan until half way through the movie? There was a lot of questionable motives in the movie, and I’m sure they could’ve cut out 15 or 20 minutes of a lengthy screen time just by shortening some of these scenes. WARNING: SPOILERS AHEAD, STOP READING IF YOU HAVEN’T WATCHED THE FILM YET. Okay, I understand certain people’s gripes about The Last Jedi. I cringed when I saw Leia fly through space like Superman, I’m not going to lie to you. Most fans are up in arms about the comedy in the film, but I had no problem with it. It was Disney comedy, don’t get me wrong, some of the lines felt like they were grabbed straight out of the Avengers’ films, but I think a bit of humour isn’t a bad thing, especially with the Caretakers on Ahch-To. While some people cried foul about Luke making some jokes and being “different than the Luke we all know,” the writing was on the wall since the first scene where Luke throws the lightsaber off the cliff. I for one was glad we didn’t have the goody-two-shoe farm-boy Luke from the original trilogy, Mark Hamill’s latest take on the character was very well done, and he plays the damaged hero to a tee. Some people have called the new Luke a “coward” for hiding away and refusing to go back to the real world, but it all makes sense the way Johnson spins it. On top of that, Luke’s actions of trying to kill Kylo Ren on an instinct gives Kylo more of a reason for being against Luke and the Resistance. Add on top of that, Kylo killed his own leader in order to be with Rey and rule together, just for Rey to turn her back on him and throw away everything he just did. It’s such a fascinating conflict between Kylo and Rey, and Luke for that matter, it has to be one of the best story lines in Star Wars history. I thought the final battle was well thought out, and it makes sure that Mark Hamill will return in Episode 9, which they’ll need since they won’t have Carrie Fisher to reprise her role. Some people were hoping for one last big hurrah from Luke in an intense lightsaber battle, but instead we got the exact opposite, a diversion for the Resistance to escape, much like what Ben Kenobi did for Luke and the gang back in A New Hope, had the same feel to it minus a few hacks. Snoke was another downside for me in this film. It really did feel like Rian Johnson simply didn’t care for the character that J.J. Abrams created, so he just decided to kill him off rather than save him for another movie. All that mystery created in the Force Awakens about Snoke’s background and his rise to power, completely gone with one swift trick from Kylo Ren. And while Nathan pointed out that they’ll probably explain his importance in a book at some point, it wasn’t good enough for me. It was supposed to be a major twist in the plot, and because I didn’t really care about Snoke or see his major importance rather than just being “that big bad guy,” I didn’t really get the full impact of the moment as I maybe should have. Another writing issue people have, is Rey’s background, which I don’t actually have a problem with, although I get why fans are upset. All throughout The Force Awakens, Rey talks about waiting for her parents to return to Jakku, and while Maz tells her that deep down she knows they’re not coming back, for Kylo to flat out tell Rey her origins, and that she knew it the whole time, kinda feels a little bit like a let down, just because it now comes across as a waste of time if you re-watch The Force Awakens and spend ten minutes sitting there while Rey tries to figure out her past, when she actually knows it the whole time. Movies are fun. Now, people are upset that Rey has no heritage that ties in with famous jedi or sith that have been previously highlighted from the past trilogies, but I’m fine with her origins meaning nothing of importance. Honestly, I’d feel it would be a broken record for Rey and Kylo to be siblings, or Rey be a Kenobi or Skywalker somewhere down the line, just because George Lucas has gone that direction so many times before. And for those who gripe about that, just look at Kylo Ren. He’s the one who has all your heritage, and that’s another point of why I truly believe this trilogy is centered around Kylo Ren, not Rey. Also, not sure why they cast such a big name as Benecio Del Toro to play such a minor role, really felt like he didn’t get enough screen time or impact he probably should have. I’m still trying to figure out where I’d rank this film amongst the rest of the Star Wars films, but I can already tell you I enjoyed it more than any of the prequels or Rogue One. The Last Jedi has it’s issues, but its story arc between Luke, Rey and Kylo Ren makes up where it faltered, and continued the momentum that the current trilogy has built since arriving back in 2015. So, there’s news that there’s a deal in the works for Disney to acquire the TV & Film rights of most of 20th Century Fox for a reported $60 billion dollars, yeah, billion. While this reported deal in the works has most MCU fans going crazy (myself included), lets take a step back here and look at the effects this will have. First, this would’ve worked out much better if this all happened about 5, 6 years ago. With the MCU moving into Phase 4 after the upcoming Infinity War film, many of Marvel’s biggest names could be getting killed off in the upcoming Avengers film, so we might miss out on Iron Man and Wolverine tearing it up together, or Captain America and Cyclops leading the way together. It just might seem weird if the X-Men and the Fantastic 4 randomly show up after the events of the Infinity War, leaving all the other super heroes forced to go “where were you guys?” While I’m still praying we get a Deadpool/Spider-Man team up at some point in the future, most of the big time team up storylines won’t be possible within the MCU, unless they play with the Multiverse angle and reverse time or something, which would be a lot of work for the big screen compared to how easy it is in the comics. Second, 20th Century Fox has actually done quite a good job with the X-Men, Deadpool as well. Seeing these heroes transform from a 20th Century Fox label that lets a lot more edgy stuff go to the final cut to Disney, who tries to make their films family friendly, might take a hit on some of the characters. The biggest one being, of course, Deadpool. I’m trying to picture a Deadpool film under Disney’s umbrella that they would actually green-light, and I simply can’t. Maybe he’s just a cameo character once the transfer is done and Deadpool 2 hits the big screen, but it’s a shame, because Deadpool’s first instalment gave the superhero genre something entirely fresh. The same goes for Wolverine, good luck getting Disney to go ahead with a gory western film. The Fantastic Four on the other hand, are in desperate need of help from Disney and the MCU. Having Doctor Doom in the MCU would be huge for when Thanos is out of the picture, and if you read my article on the Secret Wars and how it could play into the MCU after the events of the Infinity War, the whole storyline is much easier with Doctor Doom and the Fantastic Four, in fact it really centralizes around them. So for the Fantastic Four, this is great news, for Deadpool and the X-Men, could mean some watering down in terms of storytelling and edginess. While I’m super excited if this all comes together, and it’s not deemed illegal, there’s still some big warning signs from this deal, for superhero genre fans anyways. While it means we may finally see some of the biggest heroes from the X-Men teaming up with the Avengers, it could also mean some less intriguing characters and less darkness and edginess to their previous versions. While it’s a risk, it’s a risk I’m hoping they take, just because I need that Deadpool/Spider-Man crossover film. Also, that Disney streaming service just got real, Netflix has some work to do. Like I said up top, the Broncos are now on my naughty list and i’m gonna bet against them every week until they show me a defence that is at least mediocre and a quarterback who isn’t actively trying to lose the game. The Jets can smell a wild card spot not too far in the distance so they will be well motivated. The Falcon are in freefall, and unless the 49ers lend them Kyle Shanahan for the rest of the season they aren’t going to pull out of it, the Saints lead by OROY Alvin Kamara will keep their surprising season going will a hard fought game that will end with the Saints on top. Alright Kansas City this is it, you managed to choke a 3 game lead in your division and if you lose this game you won’t be going to the playoffs, Alex Smith better realise he is playing for his job in this game, playing a garbage giants team masked just how bad the Raiders are, they won’t put up much of a fight after the first quarter. You know its tales a remarkably bad team to lose to the Browns, even with Brett Hundley at QB I still believe that this Browns team is so bad they will lose by 10. And the Packers will be motivated by a healthy Aaron Rodgers at practice and their playoff hopes still very much alive. I know I’m stubborn, I just won’t accept that the Vikings are good, even when they play one of my least favorite teams in the Panthers I’ll still bet against them. This is crunch time for the Panthers they need to decide if they want to be a playoff team and a contender or not, and this game will decide that. The Ben Mcadoo era is over in New York, and with that comes even more loses, last week the cowboys figured out how to run the ball even without Zeke. They will use this new skill and the recent resurgence of Dez Bryant to easily beat the Giants in the Meadowlands. Monday nights game was devastating to the Steelers, losing their second best pass option and their defensive captain will catch up to them quick, resulting in a very close game against their bitter rivals. The Ravens will win a sloppy game with either a late field goal or touchdown. These are bets I’m going to make on alternate lines for games I don’t think will be nearly as close as Vegas does. Odds will not be out for these bets at the time of writing, so no odds will be listed here. This week I’m changing my strategy for these parlays, I’m going to cast a wide net and account for multiple outcomes in close games.